The oldest known example of a Native American flute has been found right here in Northwest Arkansas. In the 1930s Samuel Dellinger, curator of the University of Arkansas Museum, sent crews out to excavate at several prehistoric bluff shelter sites in the Ozarks. These excavations unearthed many important artifacts and due to the extremely dry conditions in many of these shelters, perishables—like basketry, woven sandals, and plant remains—were preserved and collected by the museum crews. 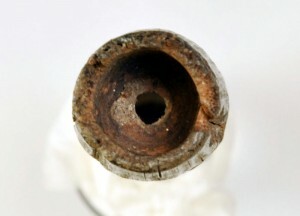 Among these artifacts was a small piece of cane with holes drilled into its shaft. A photographic detail showing the Breckenridge flute in context during the 1933 excavations. University of Arkansas Museum photo. These artifacts are still curated in the University of Arkansas Museum collections. However, the piece of drilled cane went unnoticed for almost 80 years among the thousands of specimens from Dellinger’s 1930s collections. In 2011, Arkansas Archeological Society volunteer Jim Rees identified it as a flute. This flute, recovered from the Breckenridge Shelter in Carroll County, is a two-chamber duct flute made of river cane. This is the variety of flute known today as the “Native American Flute.” It is more complicated than a simple whistle which only produces one note, or a simpler form of flute which has only one chamber and requires the player to blow over the top of the opening. Whistles and simple flutes are played the way you would blow over the opening of a bottle to produce a sound. Flutes like the Breckenridge flute are more complex. You blow directly into one chamber and the air is channeled over an opening in a second chamber which produces a sound. It operates more like a modern recorder or pennywhistle. Modern examples of the Native American Flute are made today usually from wood rather than river cane. The Breckenridge flute. Photo by Leslie Walker, Arkansas Archeological Survey, courtesy of The University of Arkansas Museum Collections. Distal end of the Breckenridge Flute, photo by Leslie Walker, Arkansas Archeological Survey, courtesy of The University of Arkansas Museum Collections. Radiocarbon dates on the river cane place the flute between about 900 and 1000 years old. This makes it the oldest flute of its kind found in North America so far. The Breckenridge flute is not the only musical instrument found in the bluff shelters. At least nine other musical instruments have been found in the collections. These include whistles, rattles, and rasps. To read more about the Breckenridge flute, you can check out its entry on Fluteopedia.